Leave A Big And Bold Impression With Our Giant US Flags! Show your patriotic pride or team spirit in a big and bold manner with our Giant US flags, designed to turn heads, they will leave the audience speechless! Be it the beautiful auditorium and field flags or a fire truck flags and much more, we have every flag you could ask for. 100% made in the USA, our premium quality flags made of 200 Denier nylon fabric are made to last long and look great. Shop right away and get the best prices, quick shipping, and much more! 100% customer satisfaction guaranteed! The bigger the better! 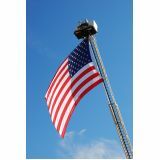 Make the world pause and take a look at our show stopping giant US flags that can be used in field events and auditoriums and as fire truck flags and more. Our extra-large flags are typically used by fire protection agencies, malls and banks among others. Offered in a range of eye popping sizes that range from 8’ x 12’ to 110’ x 180’ and all the standard sizes in between, our flags carry the lowest price guarantee too. 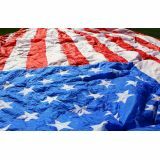 Made of commercial grade fabric , our Giant US flags are well suited for all weather use. Designed to ensure hassle free unfurling and portability, our flags will scream out your patriotic spirit in the best way possible. Well suited for large events like sporting leagues and auditoriums and for fire trucks and police vehicles, our giant flags are excellent symbols of fine craftsmanship. Browse our complete line of Giant US flags to find a model that matches your needs. Should you need any help, please feel free to reach us at our toll free number (888) 287-3524 or email at customercare@tuffflags.com and we will be happy to assist you.